An architecture & design studio established in Bucharest in 2008. Vladimir Mîndru, the founder, and Irina Bălănean who joined the studio in 2015, are both architects and graduates of Bucharest’s Ion Mincu University of Architecture and Urbanism. They share openness to challenges of contemporary design. In their projects they constantly search for the balance between utility and aesthetics and care for adaptation, experiment, sustainable development and evolution. cuisines were created, offering a wider range of experience based on the combination of design and cooking. The system functions according to the principle that particular zones are opened depending on an hour. More than just the name was retained from the story of “tram 14”. As one of construction elements, a tram rail was embedded into the industrial floor and technical drawings of the locomotive were engraved in the plywood walls. Materials, textures, lights were chosen to provide contrasting visual and touch experience. 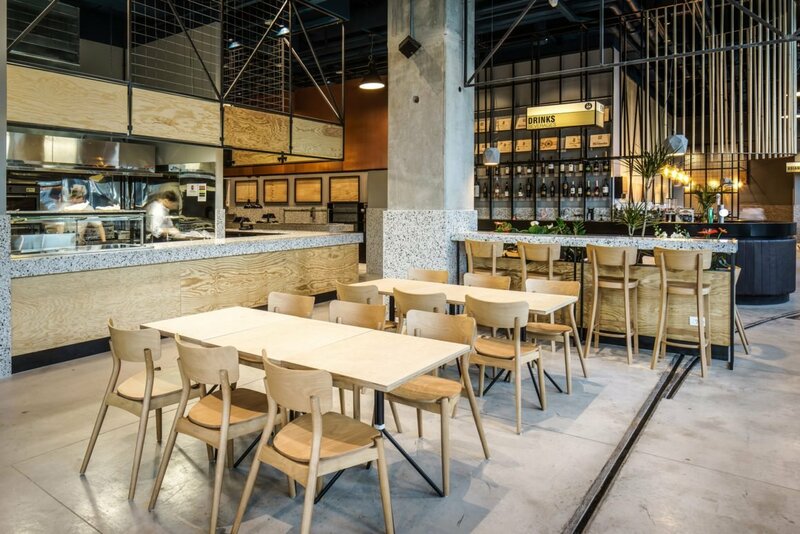 Behind the industrial metal doors the warm-light lamps are displayed, terrazzo tops are placed over wooden planks, and under the metal counter, the bar is clad in the leather. FAMEG – malibu 1506 chairs and solid BST-9449 bar stools make an important and comfortable equipment of the restaurant.